Charles-Edouard Jeanneret, widely known as Le Corbusier (October 6, 1887–August 27, 1965), was a Swiss architect famous for his contributions to what is now called modernism, or the International Style. He was a pioneer in theoretical studies of modern design and was dedicated to providing better living conditions for the residents of crowded cities. His career spanned five decades, with iconic buildings constructed across central Europe, India, Russia, and one structure in the United States. He was also an urban planner, painter, sculptor, writer and furniture designer. 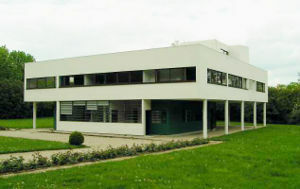 Born as Charles-Edouard Jeanneret in La Chaux-de-Fonds, a small town of Neuchâtel canton in north-western Switzerland, just across the border from France, Le Corbusier was attracted to the visual arts and studied under the tutelage of the teacher at the local arts school, Charles L'Éplattenier, who had himself studied in Budapest and Paris. He designed his earliest houses, like the Villa Fallet, the Villa Schwob, and the Villa Jeanneret (the latter of which was for his parents) in La Chaux-de-Fonds. These houses recall the indigenous mountainous vernacular architectural styles popular in the Alps. Frequently, in his early years he would escape the somewhat provincial atmosphere of his hometown by traveling around Europe. In about 1907 he travelled to Paris, where he found work in the office of Auguste Perret, the French pioneer in reinforced concrete. Between October 1910 and March 1911 he worked for the renowned architect Peter Behrens near Berlin, where he met a young Ludwig Mies van der Rohe and became fluent in German. Both of these experiences proved influential in his later career. Later in 1911 he would journey to the Balkans and visit Greece and Turkey, filling sketchbooks with renderings of what he saw, including many famous sketches of the Parthenon, whose forms he would later praise in his work Vers une architecture (1923). Jeanneret moved to Paris permanently at the age of 29 in 1916, shortly after he had begun to work on theoretical architectural studies using modern techniques. Among these was his project for the "Dom-ino" House (1914-1915). This model proposed an open floor plan consisting of concrete slabs supported by a minimal number of thin reinforced concrete piers around the edges, with a stairway providing access to each level on one side of the floor plan. The design soon became the foundation for most of his architecture for the next ten years. Soon he would begin his own architectural practice with his cousin, Pierre Jeanneret (1896-1967), a partnership that would last until 1940. In 1918 Jeanneret met the disillusioned Cubist painter Amédée Ozenfant, in whom he recognized a kindred spirit. Ozenfant encouraged him to paint, and the two began a period of collaboration. Rejecting Cubism as irrational and "romantic," the pair jointly published their manifesto, Après le Cubisme and established a new artistic movement: Purism. Ozenfant and Jeanneret established the Purist journal L'Esprit Nouveau in 1920, in whose first issue, Jeanneret adopted the moniker "Le Corbusier" (an altered form of his maternal grandfather's name, "Lecorbésier") as a pseudonym, reflecting Jeanneret's belief that anyone could reinvent himself. Some architectural historians claim that this pseudonym translates as "the crow-like one." Between 1918 and 1922 Jeanneret built nothing, concentrating his efforts on Purist theory and painting. His theoretical studies soon advanced into several different single-family house models. Among these was the Maison "Citrohan," a pun on the name of the French Citroën automaker, for the modern industrial methods and materials Le Corbusier advocated using for the house. Here, Le Corbusier proposed a three-floor structure, with a double-height living room, bedrooms on the second floor, and a kitchen on the third floor. The roof would be occupied by a sun terrace. On the exterior Le Corbusier installed a stairway to provide second-floor access from ground level. Here, as in other projects from this period, he also designed the façades to include large expanses of uninterrupted window space. The house used a rectangular plan, with exterior walls not filled by windows left as white, stuccoed spaces. Le Corbusier and Jeanneret left the interior aesthetic spare, with any movable furniture made of tubular metal frames. Light fixtures usually comprised single, bare bulbs. Interior walls were also left white. Between 1922 and 1927 Le Corbusier and Pierre Jeanneret designed many of these private houses for clients around Paris. In Boulogne-sur-Seine and the 16th arrondissement of Paris, Le Corbusier and Pierre Jeanneret designed and built the Villa Lipschitz, Maison Cook (see William Edwards Cook), Maison Planeix, and the Maison LaRoche/Albert Jeanneret (which now houses the Fondation Le Corbusier). It was, however, Le Corbusier's Villa Savoye (1929-1931) that most succinctly summed up his five points of architecture that he had elucidated in the journal L'Esprit Nouveau and his book Vers une architecture, and which he had been developing throughout the 1920s. First, Le Corbusier lifted the bulk of the structure off the ground, supporting it by pilotis--reinforced concrete stilts. These pilotis, in providing the structural support for the house, allowed him to elucidate his next two points: a free façade, meaning non-supporting walls that could be designed as the architect wished, and an open floor plan, meaning that the floor space was free to be configured into rooms without concern for supporting walls. The second floor of the Villa Savoye includes long strips of ribbon windows that allow unencumbered views of the large surrounding yard, and which constitute the fourth point of his system. A ramp rising from the ground level to the third floor roof terrace (the fifth point) allows for an architectural promenade through the structure. The white tubular railing recalls the industrial "ocean-liner" aesthetic that Le Corbusier much admired. As if to put an exclamation point on Le Corbusier's homage to modern industry, the driveway around the ground floor, with its semicircular path, measures the exact turning radius of a 1929 Voisin automobile. For a number of years French officials had been unsuccessful in dealing with the squalor of the growing Parisian slums, and Le Corbusier sought efficient ways to house large numbers of people in response to the urban housing crisis. He believed that his new, modern architectural forms would provide a new organizational solution that would raise the quality of life of the lower classes who lived in such dirty quarters. His Immeubles Villas (1922) was such a project that called for large blocks of cell-like individual apartments stacked one on top of the other, with plans that included a living room, bedrooms, and kitchen, as well as a garden terrace. Not merely content with designs for a few housing blocks, soon Le Corbusier moved into studies for entire cities. In 1922, he also presented his scheme for a Contemporary City of Three Million Inhabitants. The centerpiece of this plan was the group of sixty-story cruciform skyscrapers built on steel frames and encased in huge curtain walls of glass. They housed both offices and the apartments of the most wealthy inhabitants. These skyscrapers were set within large, rectangular park-like green spaces. At the very center was a huge transportation center, that on different levels included depots for buses and trains, as well as highway intersections and at the top, an airport. (He had the fanciful notion that commercial airliners would land between the huge skyscrapers). Le Corbusier segregated the pedestrian circulation paths from the roadways, and glorified the use of the automobile as a means of transportation. As one moved out from the central skyscrapers, smaller multistory zigzag blocks set in green space and set far back from the street housed the proletarian workers. Le Corbusier hoped that politically-minded industrialists in France would lead the way with their efficient Taylorist and Fordist strategies adopted from American models to reorganize society. In this new industrialist spirit, Le Corbusier began a new journal called L'Esprit Nouveau that advocated the use of modern, industrial techniques and strategies to transform society into a more efficient environment with a higher standard of living on all socioeconomic levels. He forcefully argued that this transformation was necessary to avoid the specter of revolution that would otherwise shake society. His dictum "Architecture or Revolution," developed in his articles in this journal, became his rallying cry for the book Vers une architecture ("Towards an Architecture," translated into English under the incorrect title Towards a New Architecture), which was comprised of selected articles from L'Esprit Nouveau between 1920 and 1923. The theoretical urban schemes continued to occupy Le Corbusier. He exhibited his Plan Voisin (sponsored by another famous automobile manufacturer) in 1925. In it, he proposed to bulldoze huge sections of Paris north of the Seine and replace it with his sixty-story cruciform towers from the Contemporary City, placed in an orthogonal street grid and park-like green space. His scheme was met with only criticism and scorn from French politicians and industrialists, although they were favorable to the ideas of Taylorism and Fordism underlying Le Corbusier designs. Nonetheless, it did provoke discussion concerning how to deal with the cramped, dirty conditions that enveloped much of the city. In 1928 Le Corbusier and Perriand began to put the expectations for furniture Le Corbusier outlined in his 1925 book L'Art Décoratif d'aujourd'hui into practice. In the book he defined three different furniture types; type-needs, type-furniture, and human-limb objects. He defined human-limb objects as: "Extensions of our limbs and adapted to human functions that are. Type-needs, type-functions, therefore type-objects and type-furniture. The human-limb object is a docile servant. A good servant is discreet and self-effacing in order to leave his master free. Certainly, works of art are tools, beautiful tools. And long live the good taste manifested by choice, subtlety, proportion and harmony". The first results of the collaboration were three chrome-plated tubular steel chairs designed for two of his projects, The Maison La Roche house in Paris and a pavilion for Henry and Barbara Church. The line of furniture was expanded for Le Corbusier's 1929 Salon d'Automne installation Equipment for the Home. In 1964, while Le Corbusier was still alive, Cassina S.p.A. of Milan acquired the exclusive worldwide rights to manufacture his furniture designs. 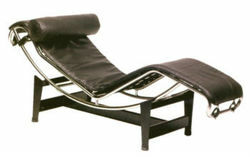 Today many copies exist but Cassina is still the only manufacturer authorized by the Fondation Le Corbusier. On August 27, 1965, against his doctor's orders, Le Corbusier went for a swim in the Mediterranean Sea at Roquebrune-Cap-Martin, France. His body was found by bathers and pronounced dead at 11 am. It is assumed that he suffered a heart attack, at the age of 78. His death rites took place at the courtyard of the Louvre Palace September 1, 1965 under the direction of writer and thinker Andre Malraux, who was at the time France's Minister of Culture. 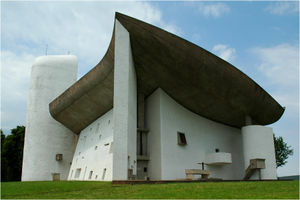 Le Corbusier's death had a strong impact on the cultural and political world. Homages were paid world wide and even some of Le Corbusier's worst artistic enemies, like painter Salvador Dalí, recognized his importance and sent a floral tribute. In the Cold War era, the President of the United States said: "His influence was universal and his works are invested with a permanent quality possessed by those of very few artists in our history". The Soviets replied: "Modern architecture has lost its greatest master". Japanese TV channels decided to broadcast simultaneously his Museum in Tokyo, in what was at the time a unique media homage. Le Corbusier was at his most influential in the sphere of urban planning, and was a founding member of the Congres Internationaux d'Architecture Moderne (CIAM). One of the first to realize how the automobile would change human agglomerations, Le Corbusier described the city of the future as consisting of large apartment buildings isolated in a park-like setting on pilotis. Le Corbusier's theories were adopted by the builders of public housing in the United States. For the design of the buildings themselves, Le Corbusier said "by law, all buildings should be white" and criticized any effort at ornamentation. The large spartan structures, in cities, but not of cities, have been widely criticized for being boring and unfriendly to pedestrians. The city plan of Brasília was based on his ideas, as was Chandigarh in India. Le Corbusier's thinking also had profound effects on the philosophy of city planning and architecture in the Soviet Union. Le Corbusier was heavily influenced by the problems he saw in the industrial city of the turn of the century. He thought that industrial housing techniques led to crowding, dirtiness, and a lack of a moral landscape. He was a leader of the modernist movement to create better living conditions and a better society through housing concepts. Ebenezer Howard's Garden Cities of To-Morrow heavily influenced Le Corbusier and his contemporaries. "You employ stone, wood and concrete, and with these materials you build houses and palaces: that is construction. Ingenuity is at work. But suddenly you touch my heart, you do me good. I am happy and I say: "This is beautiful. That is Architecture. Art enters in......"
"Architecture is the masterly, correct and magnificent play of masses brought together in light." Le Corbusier's portrait is featured on the Swiss ten francs banknote, pictured with his distinctive eyeglasses. Behrens, Roy R. (2005). COOK BOOK: Gertrude Stein, William Cook and Le Corbusier. Dysart, Iowa: Bobolink Books. ISBN 0971324417. Eliel, Carol S. (2002). L'Esprit Nouveau: Purism in Paris, 1918 - 1925. New York: Harry N. Abrams, Inc. ISBN 0-8109-6727-8.